During the Rahu transit in Cancer, matters pertaining to your relationship may come to the fore. Misunderstandings and differences with your partner will increase while the transit of Rahu in the 7th House is effective. The health of your spouse may suffer or the problems in general may increase and this will bother you. This Rahu transit in Cancer may also increase the distance between you and there may also be communication gaps. Problems with in-laws are also foreseen. You will have to develop your interpersonal skills and work towards presenting your ideas to others in a more convincing manner. Getting iritated with others if they don't agree with you on certain matters won't help, rather try to be more accomodative to the opinions of others. During this transit, you are likely to be get more diplomatic gradually. Learn to take things in a lighter vein and avoid getting into confrontations with people. If you are into partnership business, then your equations with your partners may get strained and this may also result in to severing of ties with them. 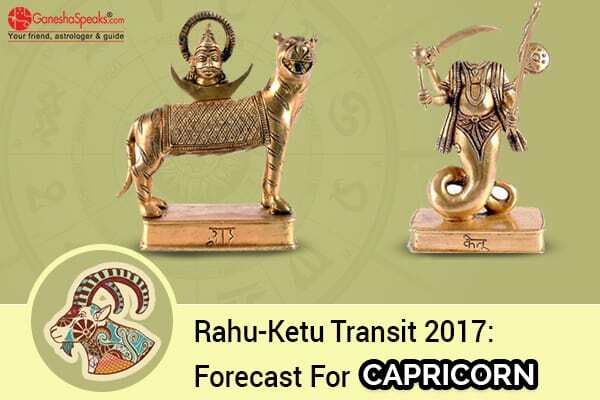 The Ketu transit in Capricorn may prove to be difficult period, filled with a lot of confusion in various areas of life. You may find it difficult to take decisions quickly and you may keep feeling lost. On most occasions, you are likely to lack the spirit and enthusiasm to do anything and take the initiative. The feelings of detachment and aloofness might just get stronger while the transit of Ketu in the 9th House takes place. The areas that may suffer the most will be your career and personal life. Meeting deadlines will seem extremely difficult for you and there are chances of some important projects getting stuck. Your rivals and competitors may try to take advantage of your weaknesses, so you will have to be careful. The good news is that you may get a lot of opportunities to travel and you may get to learn a lot during the travels. You will have to take good care of your health as there are chances of health issues like fever and stomach ailments. This will be a good time for spiritual growth though, so make the most of it.